Triathlon: Important part of our digital nomad lifestyle is to be fit, both mentally and physically. Training and participating in triathlon events during our travels is something we both love to do. Steven coming from an athletics background (400m) and Diana from mountain biking. Central America is a paradise for those who like to run trail or on the road, swim in open water and bike incredible climbs few ever saw before. We write about our training, training locations and the road to triathlon events we participate in during our travels. Training while traveling is easier than you think! Enjoy the read! Campeche is the dream of every athlete: sunny, warm and a fresh sea breeze. Immediately after we arrived to the old city, we passed a large sport centre called Unidad Deportivo 20 de Noviembre, a white and green building right behind the beach boulevard just a few blocks from the city center. Even though we got there when it was Semana Santa, and most stores and parks are closed for the holidays, we found this olympic-size swimmingpool to be open. Swimming. 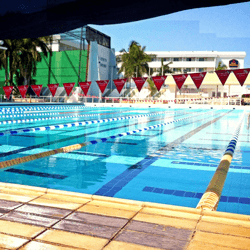 Unidad Deportivo 20 de Noviembre, offers opportunity to swim in a 50-meter outdoor pool. We have never swam in a pool with such good water quality. You could look and see the other side of the pool 50 meters ahead!! It was a delight. 20 de Noviembre is a big sports facility that offers nice changing rooms with showers and toilets. It is open Monday to Saturday from 8.00am to 17.00 pm. For 30 pesos per person you can swim here and use the facilities. Location: Avenida Adolfo Ruiz Cortines and Calle 53, opposite Hotel del Mar, Campeche City, state of Campeche, Mexico. Admission: 30MXN per entrance. Open: 6 days a week, except sundays. Diana running 7km along ‘el Malecon’. Running. Campeche has a well-lit and safe seaside road called ‘el Malecon’. To go back and forth the entire length of this road takes you 5 kilometers one way and 5 kilometers back. The distance is marked with little white signs indicating every 100m you go. If you go around 6 in the evening and you enjoy a breathtaking sunset along the way. Small fitness parks offer a variety of exercises to do at the end or beginning of the workout. The ‘Malecon’ is always open. If you look for a nice run while you travel, Campeche offers a good spot. Biking. Campeche is a really hot place most of the year. 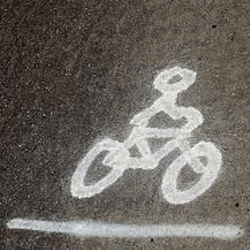 Biking is flat and hot around Campeche, so if you go for a trainingride, go really early in the morning around 6.30am. If you are up for a climb or want to have some interval in your training, take the road from Campeche to Lerna and take the exit to the left to the Parque Ecologico and back to the main road. You will be up to some (modest) climbing, just enough to get your heart racing for a while. We biked to Lerna, a small fisherman village 15 kilometers outside of Campeche and back on Easter sunday. Didn’t bring your bike? Campeche has several locations that rent (mountain)bikes.